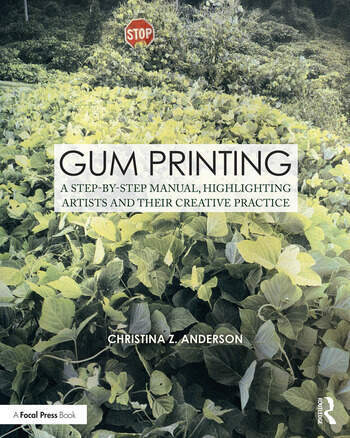 Gum Printing: A Step-by-Step Manual Highlighting Artists and Their Creative Practice is a two-part book on gum bichromate written by the medium’s leading expert, Christina Z. Anderson. Section One provides a step-by-step description of the gum printing process. From setting up the "dimroom" (no darkroom required!) to evaluating finished prints, it walks the reader through everything that is needed to establish a firm gum practice with the simplest of setups at home. Section Two showcases contemporary artists’ works, illustrating the myriad ways gum is conceptualized and practiced today. The works in these pages range from monochrome to colorful and from subtle to bold, representing a variety of genres, including still lifes, portraits, nudes, landscapes, urbanscapes and more. Featuring over 80 artists and 400 full-color images, Gum Printing is the most complete overview of this dynamic and expressive medium that has yet appeared in print. Christina Z. Anderson’s work focuses on the cultural and spiritual landscape expressed in 19th century photographic techniques, primarily gum and casein bichromate. Her work has shown nationally and internationally in over 100 shows and 40 publications. She has authored several books, two of which—The Experimental Photography Workbook and Gum Printing and Other Amazing Contact Printing Processes—have sold worldwide in 40 countries. She is co-author with Samuel Wang, S. Carl King, and Zhong Jianming of Handcrafted: The Art and Practice of the Handmade Print, now in its third printing. Anderson is Associate Professor of Photography at Montana State University, Bozeman. To see her work, visit christinaZanderson.com.